I have yet to read a blog yet that doesn’t say “I love Halloween” and here is no different, so let’s get this out in the open, I love Halloween! Creativity and imagination are fully permitted to get the better of us during the planning and prepping and celebrating of this holiday, and it is absolutely the same when you start to talk about the food! Namely the desserts! Just like when doing Halloween decorating, you can focus on the creepy, or keep it more fun and whimsical. You can serve up wet grapes that look like eyeballs (yuck!) or you can put little candy googly eyes on everything (yeah!). It’s totally your call, but seeing as how you’ll want to make something to indulge in, here are 15 Spooky Sweet Halloween Desserts. 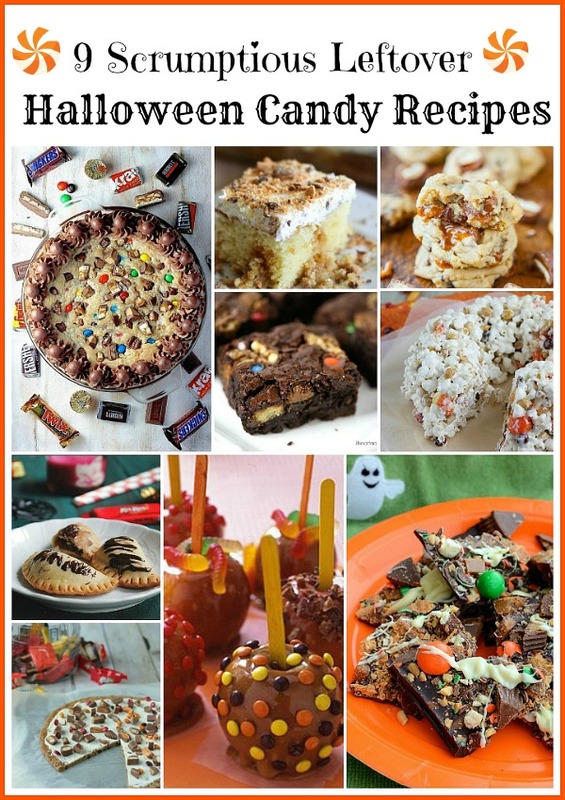 There’s no reason to keep all the Halloween dessert fun to yourself! 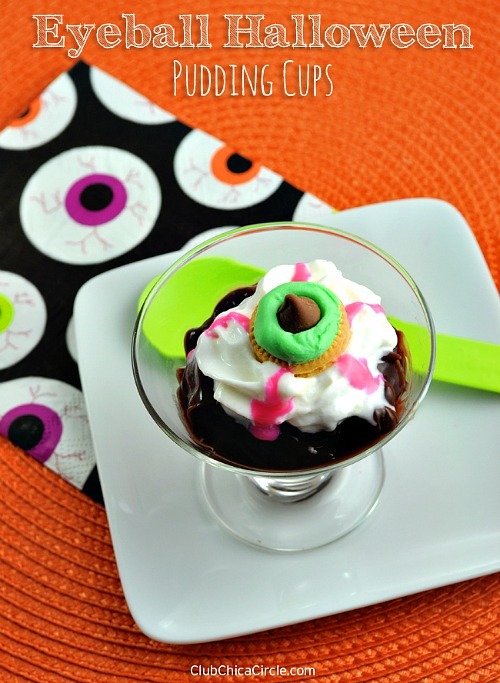 If you have kids or grandkids, they’d be more than happy to help out making these spooky treats! Part of what makes Hallowen desserts so fun is the fun colors! So before you start your Halloween baking, you may want to stock up on your food coloring, so you don’t have to worry about running out. 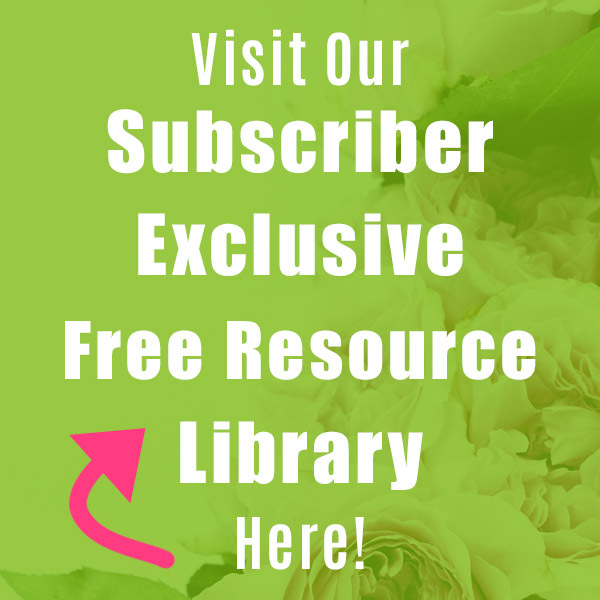 If you want to avoid aritficial additives, you might want to try naturally derived food colors. So, I’ve clearly opted to go the fun and whimsical route with desserts like Minion Mummies and Frankenstein Wafer Cookies. Plus, I threw in some good ideas to indulge on, like Pumpkin Fudge Éclair Cake (right??) 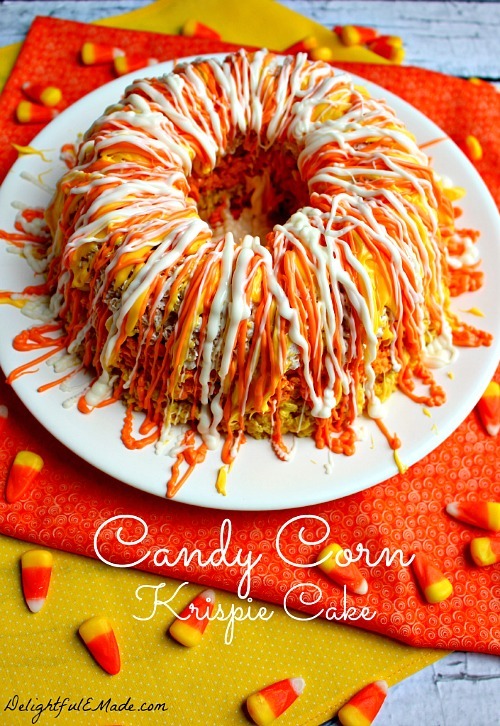 and Candy Corn Krispy Cake! 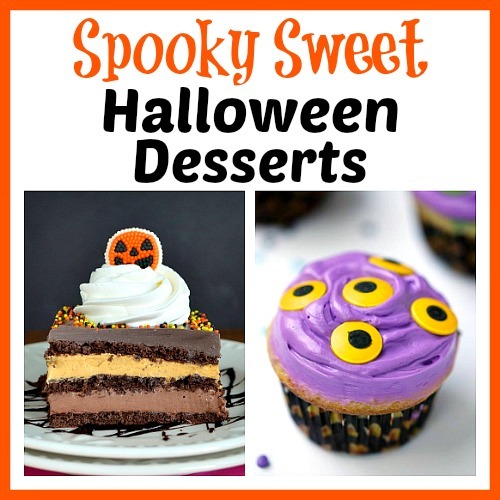 Enjoy these 15 Spooky Sweet Halloween Desserts and be sure to tell us which ones are your faves! 1. 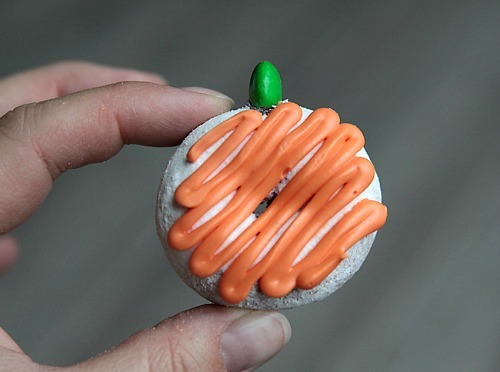 These Pumpkin Donuts by It’s Always Autumn are too cute, and way easy! These would make a great addition for a fun lunch, or served up to a class or party. 2. 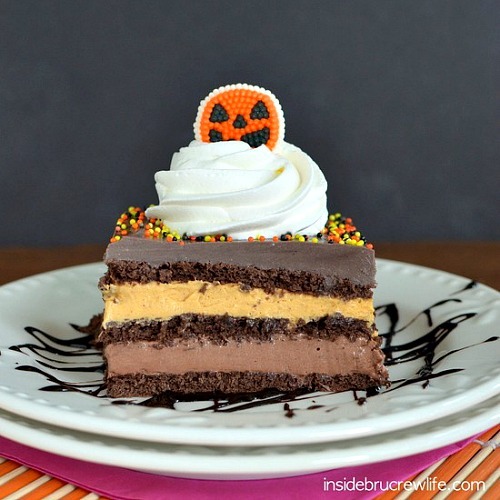 It is no secret that I am drooling over this Pumpkin Fudge Éclair Cake by Bru Crew Life. This is just such a great idea! 3. 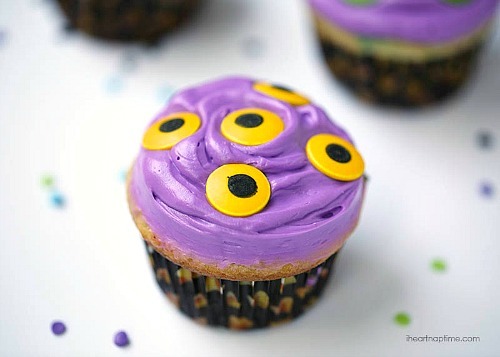 These Monster Cupcakes by I Heart Naptime are perfect for a little Halloween fun! And easy too. 4. 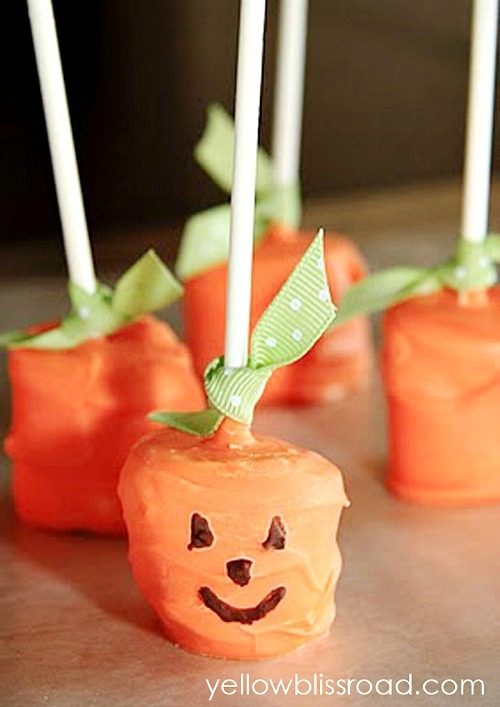 These Pumpkin Marshmallow Pops by Yellow Bliss Road are really simple, yet very fun! 5. While these Eyeball Dessert Cups by Club Chica Circle are getting a wee bit on the creepy side, they’re still lots of fun, and super tasty! 6. 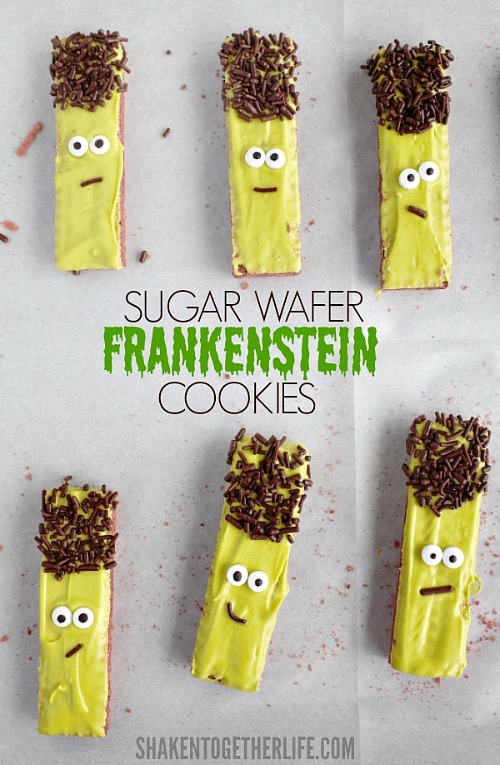 These Frankenstein Wafer Cookies by Shaken Together Life are sure to be a hit! Also, very budget friendly. 7. 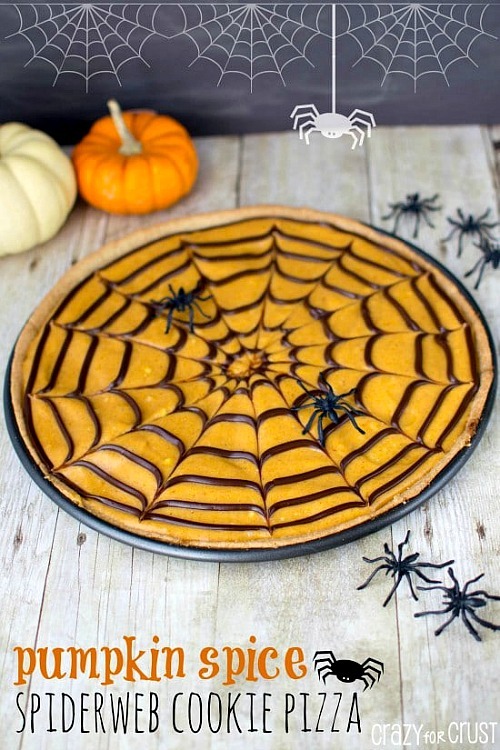 This Spider Web Cookie Pizza by Crazy for Crust will take a bit more effort, but will be so worth it! 8. 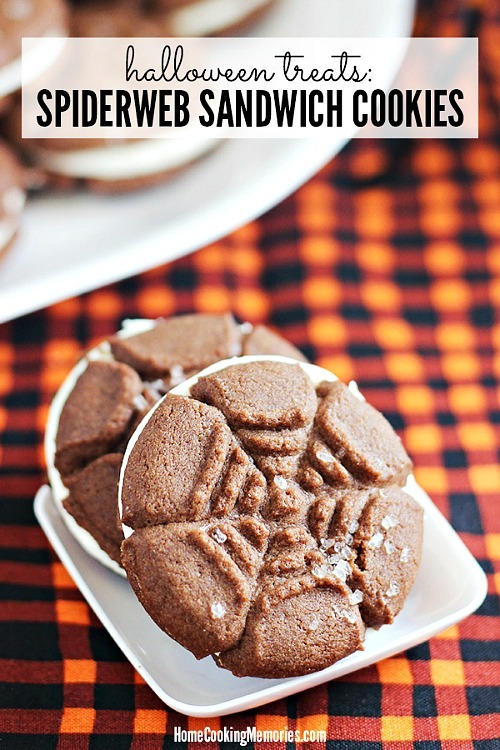 These Spider Web Sandwich Cookies by Home Cooking Memories are just what you want to enjoy to get a break from all the candy! 9. 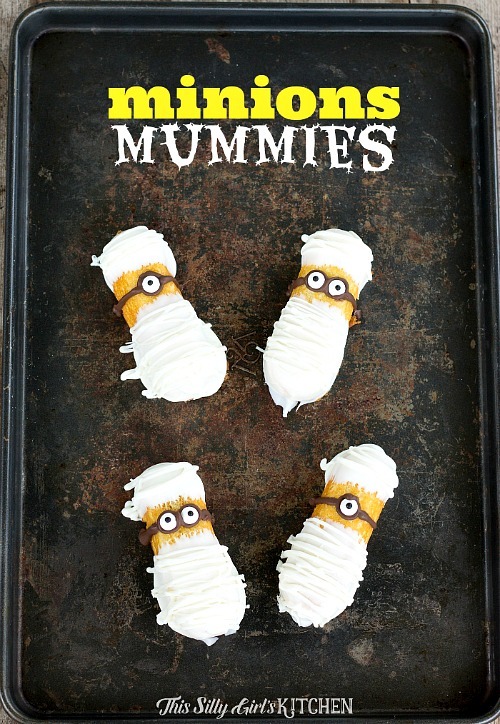 The Minion Mummies by this Silly Girl’s Kitchen are very cute, and very fun! 10. 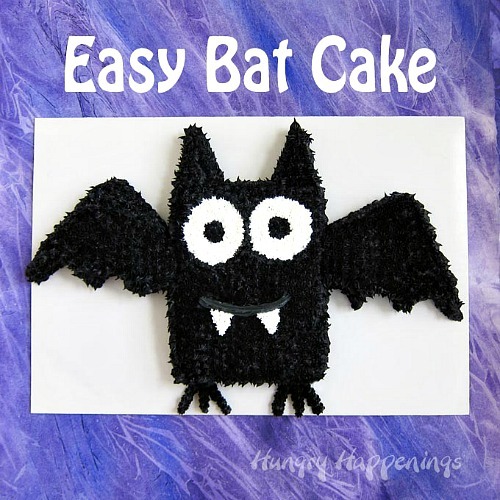 This clever Bat Cake by Hungry Happenings is one of those genius cut up cakes, and in this case you’re taking a regular square cake, and re-arranging it to look like a bat. Again, very easy on the budget! 11. 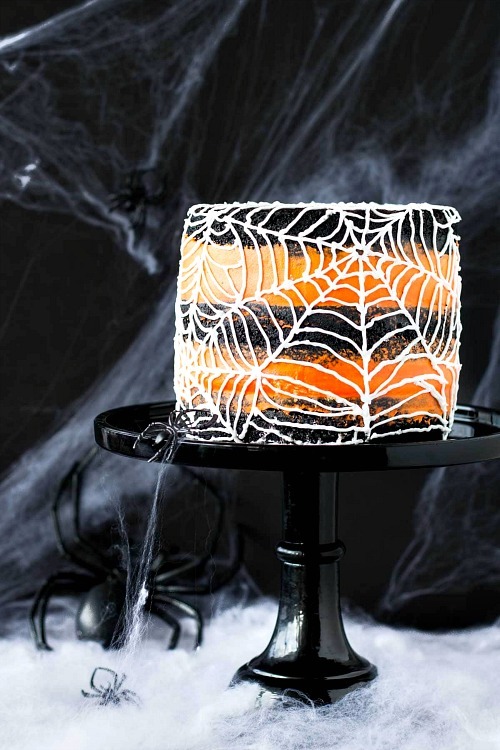 This Spider Web Cake by Liv for Cake is going to be the star of the party! 12. Also, this Candy Corn Krispy Cake by Delightful E Made is a real show stopper! I am pretty sure the kids are going to love this. 13. 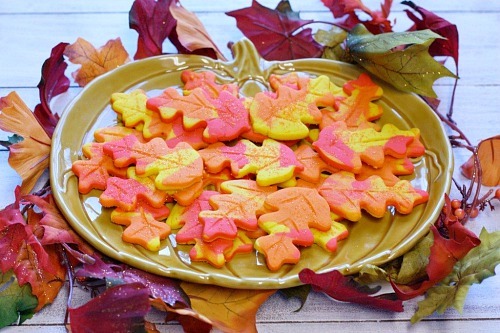 These Fall Foliage Sugar Cookies by Food, Folks, and Fun offer up a lighter dessert alternative that we just kind of need this time of year. 14. 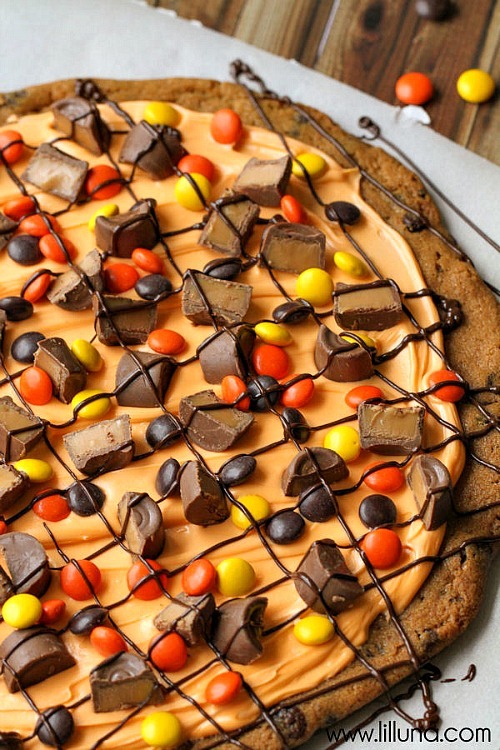 And this Halloween Cookie Cake by Lil’ Luna is pure indulgence. I think all of my favorite treats are in this dessert, and I can’t wait until we can sample one ourselves! 15. 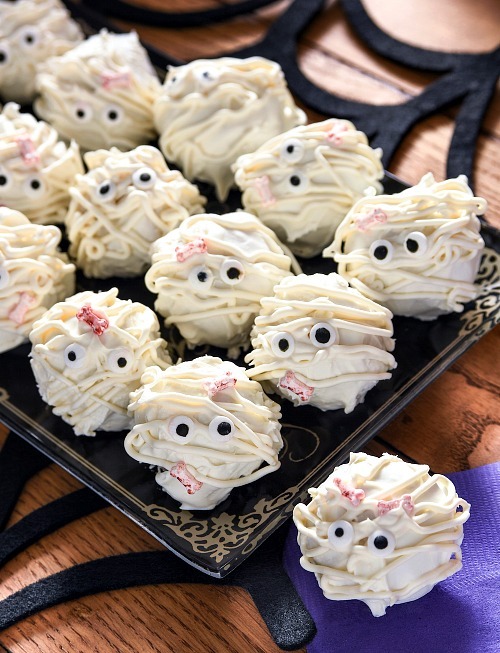 Whip up some Mummy Halloween Truffles by Mod Podge Rocks to serve to friends when they stop by. Because they are adorable. Seriously though, there is something to be said of the recipes we grew up with – I think caramel popcorn balls are probably the cheapest thing you can make that is acceptable Halloween fare, along with maybe homemade sponge toffee. Which, by the way, is really really good and fun to make if you haven’t tried it. However, even if our creative juices are overflowing, there are ways we can bake our hearts out without breaking the bank. Buy in bulk. This time of year is good for buying in bulk as dry goods will definitely keep for all the seasonal baking you are facing for the next three months. Make sure you have good storage so that you can buy in bulk and hit the sales. Good quality plastic bins with well-fitting lids are awesome in the cupboards for storing things like bags of marshmallows, candies and so on. And don’t forget to think outside of the box. For example, you don’t have to run to the store for orange food coloring if you already have red and yellow, and do a quick Internet search for substitutions should you find yourself out of an ingredient. 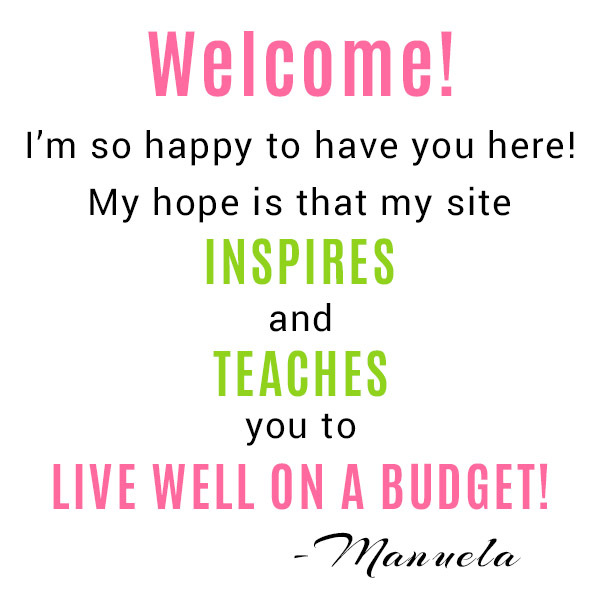 For more ideas, check out my post on 50 Things You Can Do to Save Money on Groceries. The tips apply year round, but are especially handy as we get into the holiday season! Written by ACN Team Member Evelyne N. : Evelyne is the fearless, axe wielding, quirky, hardworking and incredibly funny creative genius behind Nemcsok Farms and Knits’ End. Who also has a weird fascination with soil, and wreaths. 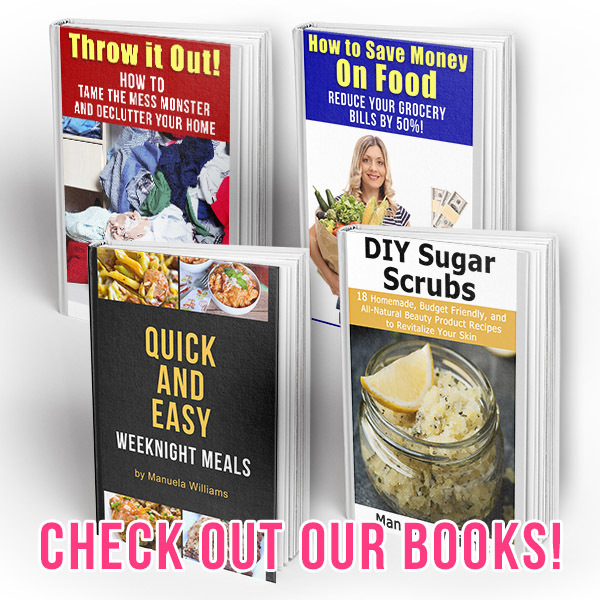 This post contains affiliate links to Amazon, which means that I may earn a small commission from some of the links in this post. 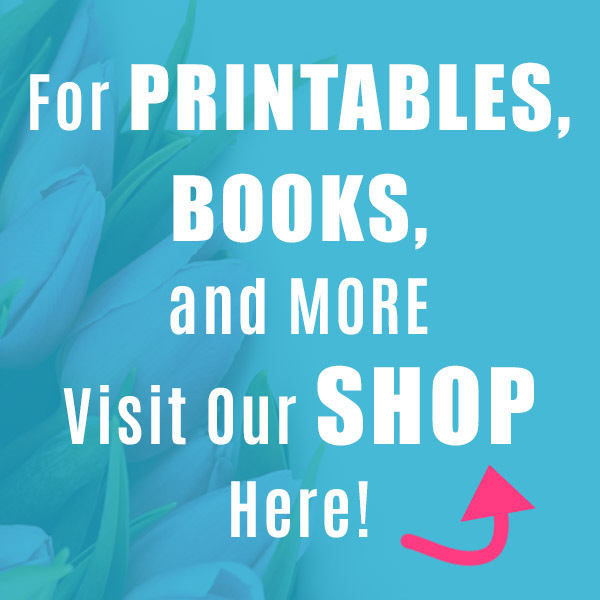 Thanks for supporting this site! Please see our Disclosure Page for more information. I should have started on Halloween desserts a long time ago. Now I have to play catch up. There are at least four things here I’d like to make. Hopefully, I can work up the nerve to tackle the Spider Web Cake.